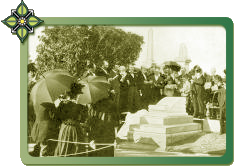 At St Kilda Cemetery on 27 August 1898, Mrs Bowman, the daughter of John Craig attended the funeral of her father for the second time. The first burial had occurred almost sixty years earlier at Point Ormond when she was eight years old. 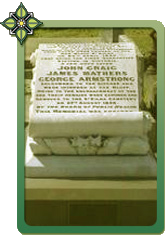 Also reburied were the remains of George Armstrong and James Mathers. Civic leaders including the mayor and a 100 spectators attended the reburial ceremony to commemorate St Kilda’s early pioneers. In 1840 Craig, Armstrong and Mather had arrived in Port Phillip on an overcrowded emigrant ship from Scotland called the Glen Huntly. John Craig was a weaver with seven children. The ship was flying the yellow fever flag, alarming the inhabitants of the small town of Melbourne. Lieutenant Governor Charles La Trobe ordered Victoria’s first quarantine station to be set up at Point Ormond. The rough canvas town under guard was exposed to bitterly cold and wet weather. Of the original 157 emigrants who had boarded the barque in Argyleshire, ten had already died at sea. The three men who subsequently died at the station were buried on the bluff, which thereby became St Kilda’s first official graveyard. For years the three graves were enclosed by a picket fence before erosion forced the reburial in 1898. Economic forces drove these emigrants, in particular England’s globalised wool industry and the new textile mills. The fencing in of common lands in Scotland to graze sheep forced the emigration of highland crofters, weavers and shepherds (common occupations of the Glen Huntly’s passengers). Ironically this wool trade with its need for new grazing lands had also initiated the settling of Port Phillip. Settlers in Australia were encouraged to sponsor immigrants with a bounty for special classes of workers. The Glen Huntly was specially built to take advantage of these profitable immigration schemes and was on its maiden voyage. Merchants made fortunes chartering vessels that crammed as many people on board with insufficient food and scant attention to comfort. An examination by the settlement’s doctor, Barry Cotter, discovered that many of the Glen Huntly immigrants including children were emaciated from their long and arduous voyage. The memory of the fever ship lives on in the current names of a Melbourne suburb, railway station and road. (Apparently Glenhuntly Road that leads to Point Ormond was once called ‘Typhus Road’ before the locals understandably begged for a change). Typhoid, as well as other diseases, continued to be a scourge in Melbourne (nicknamed ‘Marvellous Smellbourne’) till the 1890s and was accepted as a fact of life, just as we accept the road toll today. Ships’ rats carried bubonic and other plagues. The need for improved and uniform quarantine laws throughout Australia was an important impetus for federation. 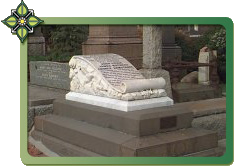 The Glen Huntly Pioneers Memorial was created in St Kilda Cemetery shortly before federation. It is a stark reminder that the new nation of Australia was overwhelming comprised of Scottish, Welsh, Irish and English immigrants and their children, many of whom who had fled from poverty by extraordinarily hazardous means. Sunday 18 April 1999 saw a gathering ofGlen Huntly descendants in St Kilda Cemetery.The gathering was almost one hundred years to the very day since the unveiling of the monument in St Kilda Cemetery to the Glen Huntly pioneers. 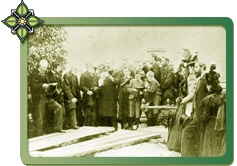 The photograph above shows the graveside service at St Kilda in August 1898 following the removal of the remains of the Glen Huntly pioneers from Point Ormond (as Red Bluff is now known). The existing monument at St Kilda was unveiled on 16 April 1899. The Glen Huntly story is described on our general tour of the cemetery.